Emilia Romagna beats Friuli in extra time and graduates the Under 15 Italian champion. In the final of the tournament of the Under15 representatives of Chianciano Terme, Emilia Romagna conquers, thanks to the best express game and the double of the Bolognese Antolini, the tricolor title for representative. The match offered good technical and athletic ideas with the first time of the Friulian brand, validated by the advantage thanks to a great goal by Ferin. In the second half, Emilia Romagna finds the strength to react, press and with the passing of the minutes puts in difficulty the opponents who manage to close the second fraction of the game in the lead. In the third time the turnaround. At the 10 ° the Antolini draw arrives that will be repeated in the second extra time giving the victory to his region. 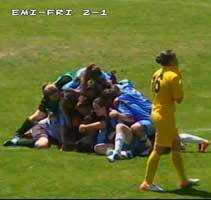 This morning, the terrible Under 15 women's football have landed in the temple of football to play the last available cartridges and outline the final grid of the finals of this tournament. The first match of the day was between Campana and Sicily, ended in goal without too many emotions and a bit of disappointment for the girls bells that aspired to victory. Subsequently, the big match of group B was played, which saw the success of Emilia Romagna on Lombardy for 1 to 0 at the end of a good race, fought and played with intensity by both formations, determined to conquer the group's leadership and access to the final for the 1 and 2 placed against Friuli Venezia Giulia, already qualified a day in advance, which has impacted with Puglia. Chianciano en rose, under 15, woke up with group A, which gave rise to two exciting and balanced races, both ended with the result of 2 1 and lots of emotions. In the afternoon, Lombardy overwhelmed Sicily for 6 at 1. GOAL AND SHOW IN CHIANCIANO TERME! The first day of the tournament of the Under 15 women's representatives was marked by the beautiful game and many goals. The best Under 15 regional took the field yesterday, at the Municipal Court of Chianciano Terme for a day of great show, pure passion, competitive spirit and a lot of technique. Eight regional formations have faced openly in races of 60 minutes divided into three times: Good morning comes from group B, at 9.00, Emilia Romagna beats with a dry 3 to 0 Sicily and confirms training to beat in the group of the favorite Lombardy that is stopped on 2 2 from an excellent Campania. The "monelle" bells, Wednesday at 18.30 will face Emilia Romagna for the game of truth while Lombardy will have to see with the island, determined to redemption match. Read more: GOAL AND SHOW IN CHIANCIANO TERME! 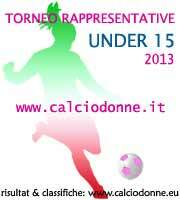 Tournament for Regional Representatives Under 15 Female, you play! 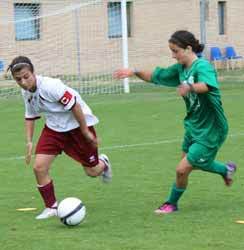 Read more: Tournament for Regional Representatives Under 15 Female, you play! Final Phase Regulation "Tournament for Regional Representatives Under 15 Female"
The Youth and Scholastic Sector organizes the Regional Women's Representative Tournament, in which young players participate as specified in the 1, 2, 3 and 9 points of these Regulations. The final phase includes the Regional Representative 8s that have been winners at the end of the preliminary interregional meetings. The final phase will take place from 23 to 30 June in Chianciano Terme (SI). Read more: Final Phase Regulation "Tournament for Regional Representatives Under 15 Feminine"